Payroll Mate® makes processing computer-repair-shop payroll easy and affordable. Pay the owner, technicians, trainers, sales staff and other employees using installable payroll software. Can handle different payroll scenarios for computer, laptop, mobile and cell-phone repair shops wanting to print checks for one employee or tens of employees. For $119 only, process payroll for up to 75 employees for one calendar year. Owning a Computer shop can be a very smart financial move since technology is an everyday constant. While the business can provide a steady income source, you will still have to worry about fulfilling payroll for your employees. With all of the tasks you are responsible for while running a Computer shop , time is very important. Payroll Mate® can provide you with a solution to help you handle your payroll so you will still have the time to concentrate on your clients needs. • With Payroll Mate®, you don’t have to worry as you can automatically calculate all the necessary taxes include State and Federal Withholdings, Social Security, Medicare, and the net pay. • Payroll Mate® allows you to set up unlimited user defined income, tax, and deduction categories so you can ensure you can pay all of your Computer shop employees. • Multiple pay frequencies and pay types are available. Some pay types include per piece, hourly, commission, salary, and many more. • Payroll Mate® supports a variety of useful payroll reports such as Payroll Totals, Taxes and Deductions, State Taxes, Payroll Journal Details and many more. • Print traditional ready to sign payroll checks. You can also print and email pay stubs for your Computer shop ’s employees. • For an additional cost add-on feature to Payroll Mate®, you can even use our convenient direct deposit. • While the program is great, you will have access to plenty of support if you need it as you can get help via chat, email and even by phone. • You can easily check out the built in tutorials any time of the day and get the answer you need as Payroll Mate® is easy to use, even for people who are not tech-savvy. • If you rely on technology to keep track of anything, you know that one issue can wipe about everything. With Payroll Mate®, you don’t have to worry as you can back up and restore your data, all in a few easy steps. One option to use is a password login, which enables you to lock out intruders. You can also mask your employees’ Social Security number on printed pay stubs for an additional security feature. 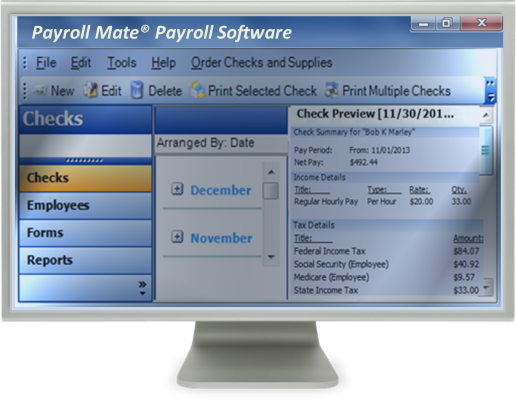 Payroll Mate ® is not hosted online and is downloaded direct to your computer so information is always available to access. • You can even export your payroll data to other major applications like Quicken, General Ledger, Peachtree (Sage 50), and Intuit QuickBooks. • Don’t worry if you have a MAC, you can easily use Payroll Mate® with virtualization programs, which allows you to use the program with no issues. When you run a computer shop, you will have a lot of work on your hands, and you will want to make it easier by any means possible. When it comes to payroll, you have a program on your side, and you can use Payroll Mate® to ensure payroll is quick and easy.